Facilitators, have you ever asked a question to your audience…a really good question (or so you thought), only to be met with blank stares? I was planning to use an actual photo of a real cricket for this post. But I when I started looking for an image, they were all kind of creepy. 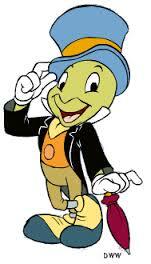 So as not to turn away any insect-averse readers, I went with a cricket of the Jiminy variety. You’re welcome…and thanks, Disney! Recently, I was leading a training workshop for a small-ish group of people, and I threw (what I anticipated to be) a discussion question out to the group, but no one picked up on it. I had to do everything shy of sing and dance to get them to talk – for which they would. have. been. sorry. Afterward, as I was reflecting on the session, I kept replaying the scenario in my head: They were a smart crowd – why wouldn’t they speak up? Why didn’t they answer my awesome question? Why didn’t they immediately jump into a fruitful discussion about the topic? And then I remembered…it’s not about me. Fellow facilitators, it’s not about us. Chances are, my audience DID have thoughts or experiences to share. Chances are, I could have posed the question in a different way. Chances are, I wasn’t exactly facilitating…I was presenting, maybe even (gasp!) lecturing. And there is a difference. We know how adults learn. We have good intentions to create an environment that is conducive for learning. But my goodness – there are times when it’s so easy to revert back to “talking at” our participants, isn’t it? Let’s be more mindful of those moments. And do something about them….to avoid those dreaded crickets. Your turn: What are your go-to “lecture alternatives” to engage your audience? Share your best ideas and methods in the comments! Know of a fellow facilitator who would appreciate this post? Be kind and share this post with your network! It’s easy to receive phase(two)learning goodness delivered directly to your inbox each week. Simply add your email address in the upper-right corner of this page. You’ll be glad you did! When I ask a group for input, and no one seems to be the first one to speak, I wait for someone to be brave. If no one steps forward, I will jokingly say, “this is where you talk”. It gets a laugh and always starts a discussion. I find that people have something to say but aren’t always comfortable being the first one to say it. This line only works if you have already established a positive and relaxed learning environment. Otherwise it could come off more like an order than an fun invitation. Hi Matt – I love how you use humor to engage the group! I do the same…but you’re absolutely right, you have to establish a rapport with your participants first. Thanks for sharing! One trick that I have used is creating a “floor plan” of the room and at the beginning of the session I have asked people their names and written them in on the “floor plan.” If the rapport is there, I will call on someone by name. Some times the “personal” approach helps. Other times, it is better to break people up, spell out the expectation of “reporting back” and have them discuss in small groups. One thing to be aware – there are some cultures that discourage conversation, and you don’t want to make people uncomfortable. That is why I always open with a little discussion about myself, and go over “housekeeping” which includes a conversation about questions. Then I ask others to introduce themselves. Once they have talked in the room, they may be more willing to talk again. Hi Ted! Great suggestions! I agree with you about making sure you’re not making people uncomfortable…not just due to culture, but sometimes I’ve found that people aren’t always comfortable speaking up in groups, and prefer to be more of an “observer”. Building a rapport and comfort level with the group sometimes helps, but it’s important to not make people feel “forced” to speak up. Thanks for your comment! I start with a “No Snoring” slide during my introduction and explain that I really appreciate their contribution to the programme in order to make it interesting and relevant to them. I also try to talk to everyone before the class starts to check their level of English as I deliver a lot of international programmes. When I throw out a question to start a discussion I go over to a flip chart, pick up a marker and say “this indicates that I am waiting for something from you :-)” this normally raises a smile and gets people to contribute. Hi Dennis! Great way to kick off a session, by setting the expectation that you want people to participate. I also like how you do a language “temperature check” as well…always good to remember when working with an international audience. Thanks for sharing!